Xishuangbanna is a prefecture in Yunnan Province, China. The capital city is Jingjong, the largest settlement in the area and one that straddles the Mekong River (Lancang River in Chinese). The six famous tea mountains region located in the prefecture produce some of the most highly regarded Pu-erh tea in the 20th century. 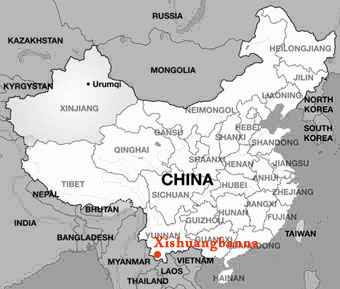 Xishuangbanna is also considered one of the most bio-diverse and ethnically rich areas of China. It has a lot of natural areas, historical and cultural resources, and is noted for its folklore, rain forests, rare plants and wildlife. Its major tourist attractions include Menglun Tropical Botanical Garden, Manfeilong Pagodas (Tanuozhuanglong), Jingzhen Pavilion, Wild Elephant Gully, Dai people’s village at Ganlanba. The well-known traditional festival is the ethnic Dai’s Water-Splashing Festival. It lasts for three days from April 13 to 15. Besides the water festival event it also consists of some other events such as Dragon boat races, firing of indigenous missiles, flying Kongming Lamps. We have made several sourcing trips to this region over the years and have now established strong friendships with old growth tea forest communities. This area is the heart of Puer teas. All kinds of Puers – Sheng, Shou, Rounds cakes and bricks – can be found in this area. Some of the most notable tea mountains Xishuangbanna include Banzhang, Nannuo, Ailao, Mansa, Bangwei and Mengsong. It is also near the popular town on Menghai, known for its processing factories.